HACK: BRINGING BACK THE OLD LUCKY ME PANCIT CANTON - I Blog, Therefore I Am. I usually don't blog about food hacks, but this one is worth sharing. We were discussing noodles the other day when my colleagues told me that the OLD (and better tasting) Lucky Me Pancit Canton is back. They said to me that John Lloyd Cruz and Bea Alonzo even had a digital video about it. More on this below. I was so happy and excited when I learned that my "old beloved" is back because Lucky Me Pancit Canton is MY ultimate comfort - and fattening - food. I discovered it in our dorm way back in college and continued my love affair with it before I got married in 2015. I stopped eating Lucky Me Pancit Canton when it had a "make-over" middle of last year. The pack is now bigger, but the noodles are flatter and thicker to give that "umami" slurp. I don't like it, and I stopped eating it. It's not just the same. The Internet agrees with me, and there's a lot of articles and petitions on bringing back the old. I personally don't like the thickness of the noodles and the difficulty to blend the powder, oil, and sauces on it. I also had to add Knorr Liquid Seasoning to add some flavors to the noodles. I was skipping all the way to our nearest 7-11 to covet packets of "the old" Lucky Me Pancit Canton. 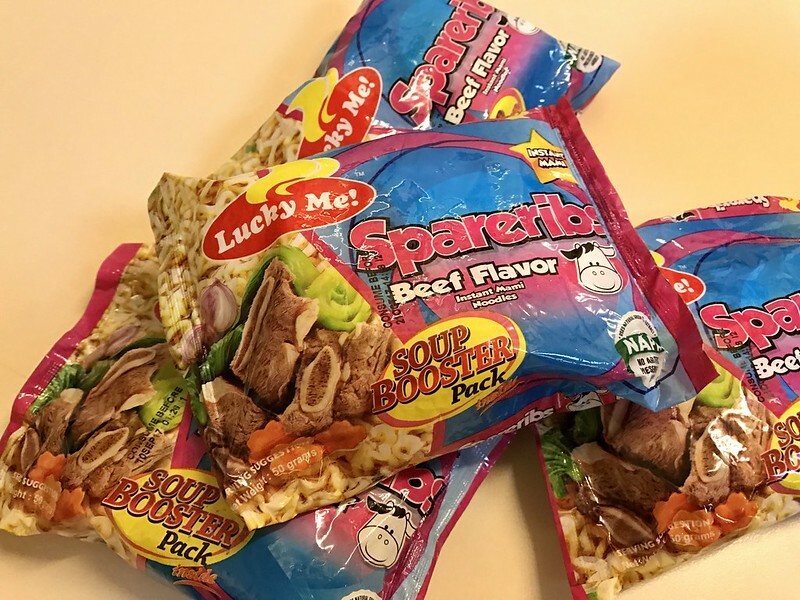 I was very disappointed when all I saw were the new Lucky Me packaging versions in different flavors. I asked the 7-11 people, and they told me that there are no new "old" and I have to settle with the new "new." I was very insisting, so I googled the Lucky Me John Lloyd-Bea video dubbed as #OurOneAndOnly to prove a point. It was a very classic Popoy-Basha video that tugs the heart. The video intends to remind us of the timeless favorite noodles. Operational word is "intends," and it was very effective. 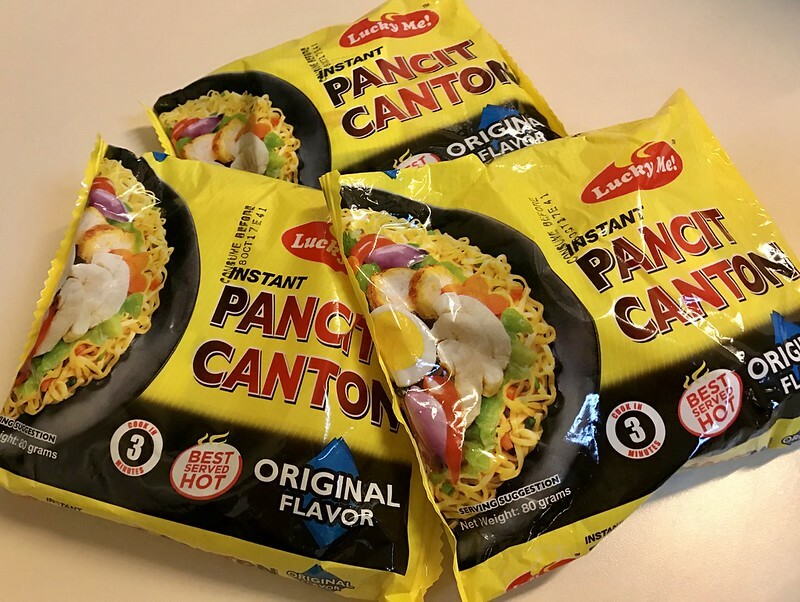 The old Pancit Canton is "NOT super back," but Lloydie and Bea reminded us of a feel-good love and how Lucky Me Pancit Canton is #OurOneAndOnly...EVEN if the packaging and noodles are new. The taste and formula of the old Lucky Me was back daw and "mas pinasarap pa" according to some replies of Lucky Me's Community Managers on their FB Page. So the story is: the newest Lucky Me Pancit Canton version has the new packaging with the new flat noodles but with the old formula and taste. But, again, the sauces and powder are not my main issue. But I am happy somehow that they brought back the old taste. My concern with the "new" Lucky Me Pancit Canton is the "new" noodles. I was still kinda disappointed, so I grabbed these super new and super latest Lucky Me Pancit Canton and tried a hack which I've been thinking for a long time. Check below! This is very easy, but you need to spend a little. Buy Lucky Me Instant Mami Noodles in any flavor. I bought the Spareribs Beef flavor. The number of packs can depend on how many you can consume. Buy the new Lucky Me Pancit Canton. Buy one less pack from the quantity of Lucky Me Instant Mami Noddles you bought. (eg. If you got 2 Lucky Me Mami Noodles then just need to get 1 Lucky Me Pancit Canton pack). Cook the Lucky Me Instant Mami Noodles the way you want your old Lucky Me Pancit Canton noodles cooked and served. Get the sauces of the new Lucky Me Pancit Canton and pour/season it to your newly-cooked or boiled Lucky Me Mami Instant Noodles. Voila! This is MY hack on how I can savor the old Lucky Me Pancit Canton again in Original Flavor. My problem with the new version was the noodles, and I figured that the Instant Mami of Lucky Me still uses the noodles that were used in the old Lucky Me Pancit Canton that I loved. I kept the noodles of the new Pancit Canton and the sauces and powder of the Lucky Me Instant Mami and will also try to pair them to avoid wasting them. I tried the "hack" twice already, and it was pancit canton heaven just like old times! I "cook" my Pancit Canton by leaving it on very hot water for 20 minutes. I want the noodles overcooked, long, and soft then I mix the powder, oil, and sauces after.